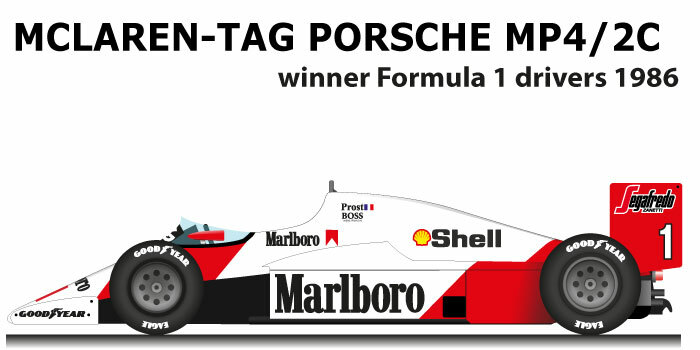 The McLaren – TAG Porsche MP4/2C n.1, and the winning car of the 1986 Formula 1 World Championship. After having repeated the success of 1984, the Woking team, decides to update the McLaren MP4/2B again, with an increase of 100 horsepower of the Porsche engine and the regulatory reduction of the tank to 195 liters. Alain Prost with the McLaren – TAG Porsche MP4/2C n.1 won the Formula 1 World Championship in 1986, for the French rider was the second consecutive world title. The season was a three-way duel between the McLaren rider and the Williams -Honda FW11 of Nigel Mansell and Nelson Piquet. The World Cup had its epilogue only at the last Grand Prix of Australia, where the English driver arrived with six points ahead of the French driver, but chose not to change the tires and a few laps from the end while he was on the head suffered a puncture tire that forced him to retire, Prost won the race and bypassed the English in the standings. Prost in the season won four Grands Prix: San Marino, Monaco, Austria and Australia.